Level 2 Bit: Great for horses who have achieved a basic training, with a degree of balance and collection and are now progressing into a particular discipline. 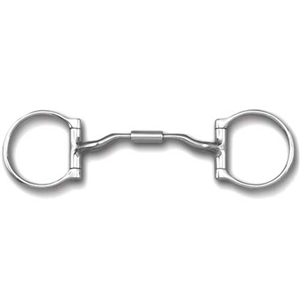 The Comfort Snaffle Wide Barrel mouthpiece features a Myler alternative to the traditional three-piece mouthpiece commonly used in snaffle bits. When the reins are engaged, the mouthpiece rotates fully onto the horse's tongue in order to apply the necessary tongue pressure to teach a horse to give to the bit or break at the poll. Made with stainless steel (no rust!) and a copper inlay this mouthpiece also has a Sweet Iron which naturally oxidizes or rusts. Harmless to horses, it has a sweet taste and promotes salivation. Myler Kimberwick Low Port Comfort Snaffle MB 04 5" The Original Reinsman Little S Hackamore - Horse Size Loose Ring French Snaffle Bit Parelli Myler Cradle C2 Narrow MB 43LP 5"